We have the following dates scheduled for this Everest Island peak climb 2011, that are guaranteed to operate with a minimum of 1 or 2 persons in the group. The trek is also available on a private basis to suit your own dates. 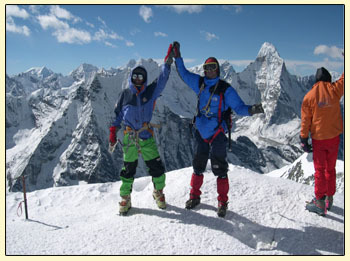 Bookings open for 2011 Island peak Expeditions, please contact us for details! Named “Island Peak” in 1952 due to its striking resemblance to a island on a sea of ice, this mountain was renamed “Imje Tse” in the early ’80s. Its original name is more often used, however. Island Peak has an impressive, highly glaciated West Face, which rises from the Lhotse Glacier. In fact, the mountain extends from the South Ridge of Lhotse Shar and is separated only by a small col. above this gap is the ridge leading to summit. From base camp, we will ascend a steep, grassy slope and small rocky steps to high camp. It is necessary to climb a steep, exposed snow and ice ramp to the summit ridge; fixed ropes will be used where necessary increasing your chances of safely reaching the summit. We will negotiate a final snow pitch before reaching the summit. Stunning views of the surrounding mountains can be seen from the peak, including Nuptse, Lhotse, Cho Poul, Makalu, Ama Dablam and Baruntse. We will break our stay in Dengboche, Shannsa, and Monjo as we make our way to Lukla for our flight back to Kathmandu. You will have completed a demanding trek and achieved the summit of one of the most beautiful mountains in Nepal. By tradition, Earthbound Expeditions buys the beers in Kathmandu for you! Fly to Lukla and start the lodge - to- lodge Everest trekking for climbing Island peak. Style: Guided trip , Tea House Trekking, partly camping. Minimum 3 person in a group, if just 1 or 2 person price will be revised. This Island peak climbing and Everest base camp trek involves walking of 4-6 hours per day and covers an altitude ranging from MIN 1300 Mtr. to MAX 6189 mtr.